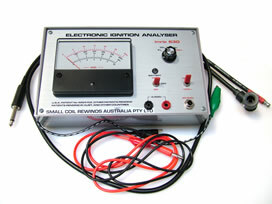 The Imrie 630, known as the “AFFORDABLE SCOPE”, analyses ignition systems by measuring its “PEAK VOLTAGE” and displaying it on an analogue meter. Oscilloscope waveforms are displayed on screens, which then needs to be interpreted by competent technicians. The oscilloscope, unlike the Imrie 630 does not easily display cranking speed voltages. An Imrie 630 is the ideal instrument for the Motorcycle, Outboard and Power Products specialists. All electric signals can be monitored and compared to either specification sheets, previously recorded information or a running engine. The Imrie 630 can measure Positive(+) or Negative(-) voltages without changing the probes around as in previous models. Switching the “POLARITY” switch to the Negative(-) position now means the RED probe will measure Negative(-) voltages. Externally mounted batteries mean no dismantling is required for replacement. Now shipped in a hard carry case for storage and handling. Measuring Pulse / Trigger coil signals (cranking speeds). Sensor (TPS, MAP, TIP-OVER, Coolant, Engine and Air temperature, etc) input and output voltages. Checking for “VOLT-DROP” during engine cranking. Checking “VOLT-DROP” in Lighting, Battery charging systems etc. etc. Monitoring Pulse / Trigger coils during engine running tests. Checking Points Magneto Source coil open circuit output. Measuring High Speed Exciter coil output (cranking speeds). Any 6 or 12 volt supplied accessory, sensor or output for correct power supply. 0 – 600 volts. (Take care! High voltages can cause serious injury or even death). Measuring High-Tension coil PRIMARY voltages, cranking and running. Take care with this test!! Check that you are using the correct “POLARITY”!!! Checking INJECTOR closing “Back EMF”. Checking Points Magneto “IN CIRCUIT” primary voltages. Testing Exciter OPEN and IN CIRCUIT voltages. 0 – 30 KV (30,000 volts). Checking High Tension output, OPEN CIRCUIT. Checking Spark Plug “FIRING” voltages, at cranking and under all operating conditions. RESERVE voltage can be calculated from the above tests. POLARITY switch allows twin lead coil systems to be quickly tested. The Imrie 630 is available for direct manufacturer purchase through Small Coil Rewinds in North Geelong, Victoria. Australia.